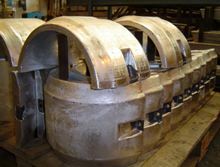 Aberdeen Foundries manufactures a wide range of bracelet style anodes and curved anode segments for fitting to different types of pipe sections and flanges. 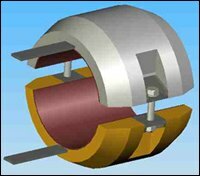 The design of the bracelet is often varied to suit the mode of fitting (topside or subsea/retrofit) or the type of pipe it isbeing fitted to (rigid or flexible). The bracelet can also be fully bolted, hinged and bolted, fully weld-on. Pipeline anodes have very specific tolerance fit to the pipe and precise nett weight requirements in order to meet cathodic protection design. There are also many specific pipe sizes and factors to consider(ID,OD,length and attachment configurations) than in selecting offshore frame or rig anodes. 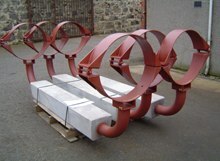 The range of sizes is therefore much greater and the anodes are often made to order. Bracelet anodes are usually coated on the inside diameter by painting with coal Tar epoxy or polyeurethane. Neoprene Liner can also be added for fitting purposes or for insulation of the anode from high pipeline temperatures. Aberdeen Foundries can offer cold bonded neoprene sheet linings and full hot autoclave bonded rubber mouldings to any thickness at our own in-house facilities. Bolts, nuts washers are provided with bracelets in either black or zinc plated form. Continuity cables are also offered in different Cu cable sizes with crimped or brazed tabs/ fittings. Stainless braided cabling and tabs are also offered along with stainless fixings, particularly for zinc based anodes. Special brackets, continuity straps and doubler plates are also offered in-house with coded welding.